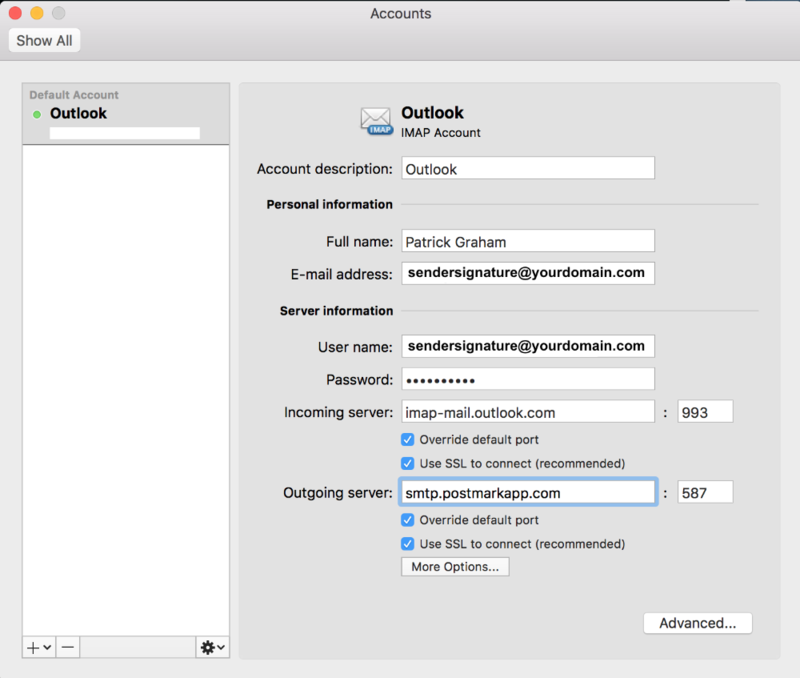 Postmark can be used to send emails from Outlook using SMTP without affecting the ability to receive emails at the email address using its existing IMAP configuration. In this help article, we show you how to configure your Outlook desktop client so that outbound emails from your Outlook account are sent via Postmark. This help article uses Outlook for Mac 2016 for screenshots. The exact views may differ for other versions of Outlook. In the Tools tab, click Accounts. This will bring up your Outlook account(s). Select the account you will configure to use Postmark for sending. For Outgoing server enter in smtp.postmarkapp.com. Set the port to 587 or 2525 and check Override default port and Use SSL to connect if they are not checked already. Click More Options… Grab your Postmark Server API Token from the Credentials tab of your server in Postmark. Change the Authentication field to ‘User Name and Password’ and paste your Server API Token in the User name and Password fields. Then click OK to save. After you have configured your outbound settings, send a test email from the account you configured to use Postmark. The email will be sent through Postmark using SMTP and available to view in your Postmark Activity. Enter in your Server API Token again for the password and check the option to save the password so that you do not have to enter it in every time you send. If the test email does not make it through, check your Postmark Activity to see if there are any SMTP API Errors. In order to send from Outlook with Postmark, the email address you are sending from must be added to your Postmark account as a Sender Signature.